The F12t is the new 12 kW boiler model from Woodfire. The stove looks much the same from the outside but they have significantly improved the combustion system by adding a tertiary air feed and improving the airwash. This produces a hotter and cleaner burn and makes for cleaner glass. They have also changed the direct air feed so that it has a straightforward airtight connection to the duct. They have kept the high output to water, low output to room which makes this stove so perfect for highly insulated passivhaus style homes. 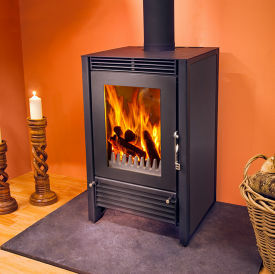 Stove expert replied: Reviews of the older model referred to it being difficult to keep the glass clean. This is always a problem on any boiler stove as the firebox temperature is significantly lower than on a dry stove. Adding tertiary air will help raise that temperature, more air across the glass will help to reduce tar deposits but most important is that the wood needs to be significantly drier (max 20-25% moisture) for a boiler stove than for a dry stove. The other tip, which again applies to almost any boiler stove, is to leave the door slightly open during the initial lighting phase. This will give the fire lots of air when it needs it most as well as increase the air over the glass when the glass is still cold, which is when the smoke condenses on the glass the most. After 10 minutes or so, as the stove is getting up to temperature, you can fully close the door. Never leave the stove unattended when the door is open.